Polystyrene spheres on glass. AFM image. Image size 5х5 μm, 200х200 points. Semi-contact mode. Left image - topography, right image - topography 3D. Image courtesy V.P. Mitrokhin, PhD, Center of Photochemistry, RAS. Polystyrene spheres on glass. AFM image. Image size 2,5х2,5 μm, 200х200 points. Semi-contact mode. Left image - topography, right image - topography 3D. Image courtesy V.P. Mitrokhin, PhD, Center of Photochemistry, RAS. Images was obtained with Centaur. AFM mode. Polystyrene spheres on glass. AFM image. Image size 10х10 μm, 300х300 points. Semi-contact mode. Left image - topography, right image - topography 3D. Polystyrene spheres on glass. 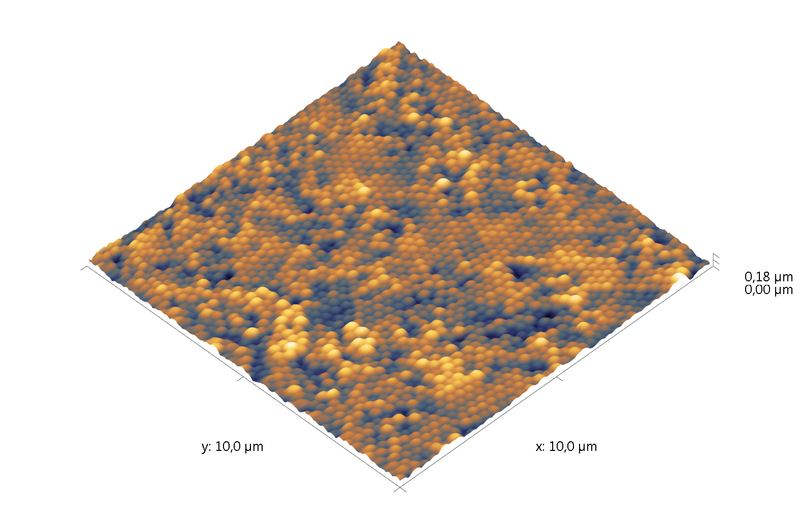 AFM image. Image size 5х5 μm, 300х300 points. Semi-contact mode. Left image - topography, right image - topography 3D. Polystyrene spheres on glass. AFM image. Image size 10х10 μm, 300х300 points. Semi-contact mode. Left image - topography, right image - "phase". Lower right image - topography 3D.